Placing players on the brink of the Atlantic Ocean, the award-winning Ocean Course is one of the best examples of oceanfront golf perfection. 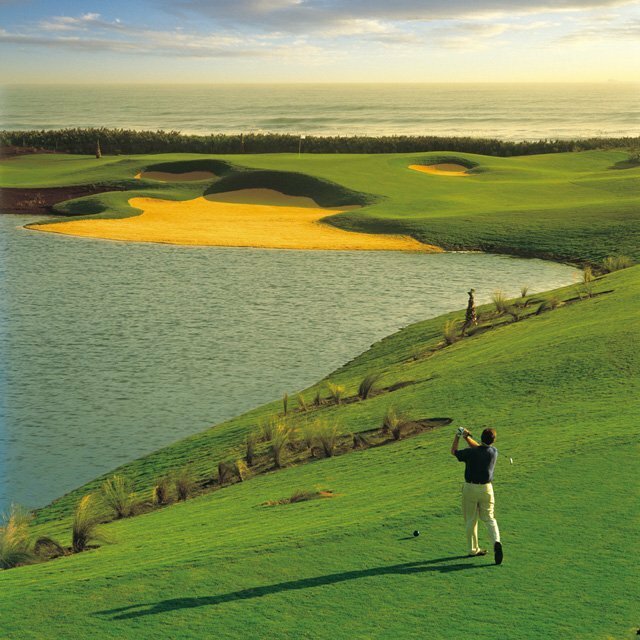 This "Top 100" course winds along pristine wetlands and sparkling lakes, but also plays six magnificent holes directly on the Atlantic Ocean. This Jack Nicklaus Signature Design concludes with a thrilling finale dubbed "The Bear Claw" - a collection of four holes precariously edging the sweeping coastline. On these holes, you will experience tees, fairways and greens perched atop natural sand dunes with incredible views and sounds of the Atlantic Ocean. Simply, the finishing holes at the Ocean Course are considered to be among the world's most memorable finishing holes. And in its short lifespan, the Ocean Course at Hammock Beach has earned a long list of awards, most notably, Golf Digest's "America's 100 Greatest Public Golf Courses", "Top 10 New Courses You Can Play", and Golf Magazine's "Top 100 Courses You Can Play in America". Players must stay at the Hammock Beach Resort to play The Ocean course.